During September at House of Fraser you can pick up this fantastic Estée Lauder Gift With Purchase when you buy 2 products from their counter (1 is to be either skincare or foundation). 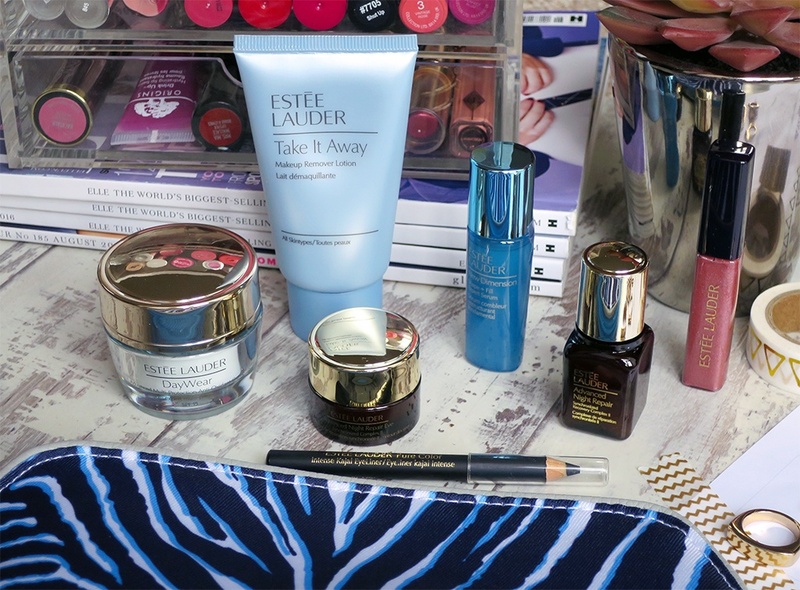 Inside this lovely blue and white printed bag you get a fantastic selection of 7 Estée Lauder beauty essentials, including some of their best sellers and a lovely mix of skincare and makeup. All the products are deluxe samples which are a really great way of getting to know a brand and also testing out if you’d like to buy the full sized version. I think a lot of you will be heading back to the counter to do just that after trying out a few of these products. This is a gentle makeup remover which promises to remove even stubborn waterproof mascara. This will leave your skin soft, clean and smooth leaving behind no greasy, oily residue. Also this is a very decent 30ml sample, which will last for quite a few face washes! This lovely lightweight day cream is rich in antioxidants and also has broad spectrum SPF15 so not only does it fight the early signs of aging it will help protect your skin from further damage which causes premature aging. It smells fresh and feels cooling on the skin. You get a 15ml deluxe sample which comes in a luxurious glass jar. I was so excited to try this out and will be taking it with me on an upcoming City Break. Serums are always a step I really enjoy in my skincare routine & Estée Lauder do some of my favourites although this is a fairly new release so its new to me & I’m very excited to try it out. This serum is all about plumping, lifting and improving facial contours with Estée Lauder’s Shaping Technology and pro-collagen complex which are designed to help improve both visible volume and structure. So this sounds like a power house of a serum and I am excited to have a 2 week sample. I am already a massive fan of this and have raved about it on my blog before, but it’s just a fantastic serum for making your skin look even, radiant and well rested. It 100% works and I am excited to have this mini sized version to take away with me. This is a great product to see included in this Free Gift and one I know a lot of people will fall in love with. So this is a fantastic eye cream, well its more like a gel formula which is so fluid and lightweight. It is designed to tackle a whole list of skin concerns including, every key visible sign of eye ageing: fine lines, wrinkles, puffiness, dark circles, dryness and uneven skin tone. Its pretty wonderful and a pot lasts for a very very long time as you only need to apply a very small amount. A kajal pencil eyeliner is a staple in every makeup bag, they can be applied lightly for a little definition, smoked out for a more intense look or just smudged along the upper & lower lash lines for that sultry effortless look. This is smooth, easy to apply and jet black. This is the perfect travel sized liner & is going straight into makeup bag. I am not a huge lipgloss wearer but I think I am in the minority there. This gloss is in the shade Reckless Bloom and is a shimmery pink. These glosses are formulated to make your lips look more plump and give you that perfect pout. They’re a hydrating gloss for smooth, lasting shine that starts with a subtle hint of colour and builds to the intensity you desire. Immediately, lips are moisturised with no stickiness. This Free Gift With Purchase from Estée Lauder is jam packed with everything you need to keep your skin looking and feeling amazing. It includes 7 Deluxe Samples and amongst them are new releases, international best sellers and some of Estée Lauder most iconic products. So head to the Estée Lauder counter at House of Fraser and take advantage of this offer during September (whilst stock lasts).